With Cloud Endpoints, our service for building, deploying and managing APIs on Google Cloud Platform (GCP), you get to focus on your API’s logic and design, and our team handles everything else. Today, we’re expanding “everything else” and announcing new developer portals where developers can learn how to interact with your API. Developer portals are the first thing your users see when they try to use your API, and are an opportunity to answer many of their questions: How do I evaluate the API? How do I get working code that calls the API? And for you, the API developer, how do you keep this documentation up-to-date as your API develops and changes over time? Much like with auth, rate-limiting and monitoring, we know you prefer to focus on your API rather than on documentation. We think it should be easy to stand up a developer portal that’s customized with your branding and content, and that requires minimal effort to keep its contents fresh. 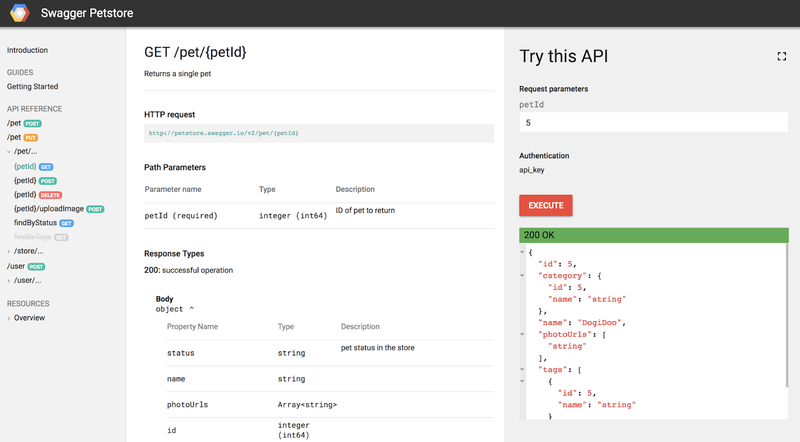 The portal includes, from left to right, the list of methods and resources, any custom pages that the API developer has added, details of the individual API method and an interactive tool to try out the API live! If you’re already using Cloud Endpoints, you can start creating developer portals immediately by signing up for this alpha. The portal will always be up-to-date; any specification you push with gcloud also gets pushed to the developer portal. From the portal, you can browse the documentation, try the APIs interactively alongside the docs, and share the portal with your team. You can point your custom domain at it, for which we provision an SSL certificate, and add your own pages for content such as tutorials and guides. And perhaps the nicest thing is that this portal works out of the box for both gRPC and OpenAPI—so your docs are always up-to-date, regardless of which flavor of APIs you use. Please reach out to our team if you’re interested in testing out Cloud Endpoints developer portals. Your feedback will help us shape the product and prioritize new features over the coming months.